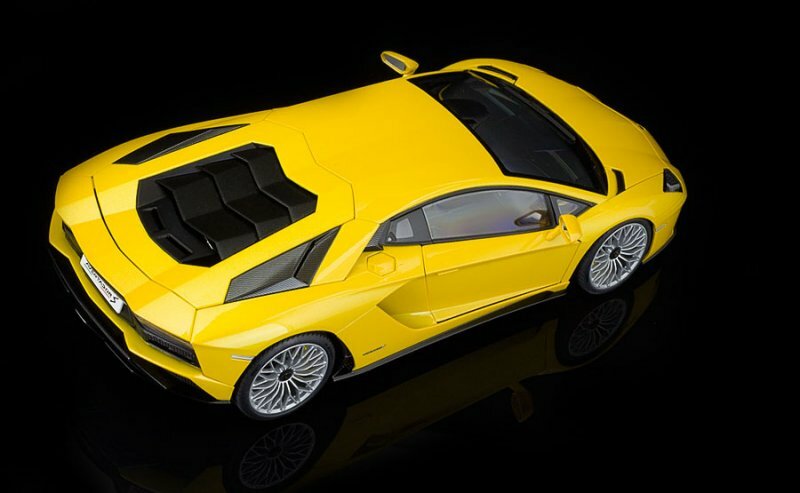 The Lamborghini Aventador LP700-4 was introduced in 2011 as the successor to the impressive Murciélago, AUTOart made a stunning 1:18 scale model of this initial Aventador model, finished in Arancio Argos just like the car taking center stage at the 2011 Geneva Motor Show and the one from the official press release. I own the first release of this model which had a black cover over the start button, a mistake AUTOart rectified with their second production batch of this iconic V12 from Sant’Agata. 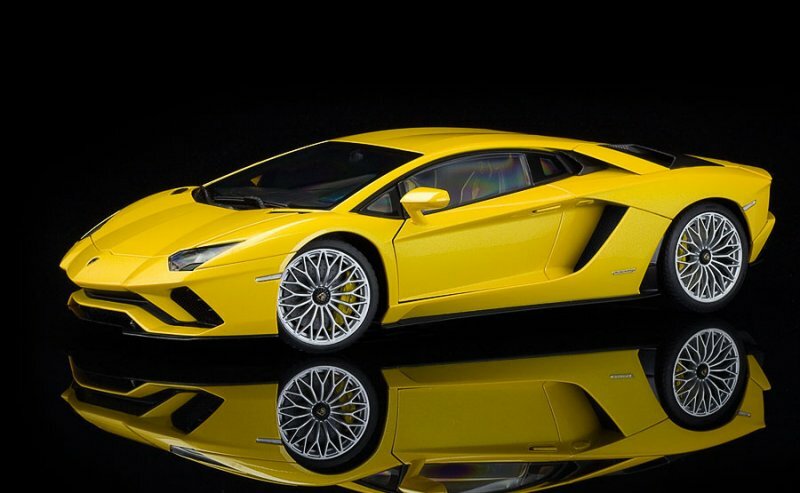 Nearly six years later, in December 2016 Automobili Lamborghini SpA introduced the mid-life upgrade to their V12 flagship, called the Aventador S, this new version came with modified aerodynamics, like the new front bumper that shows two ‘fangs’ hanging down from the top on the intakes. 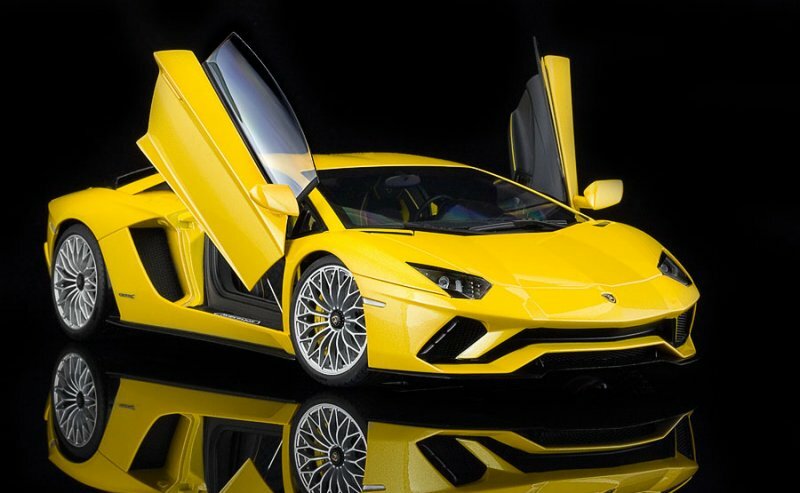 Note that the Aventador S doesn’t have any ALA yet, the Active Lamborghini Aerodynamics, that is introduced on the Aventador SVJ in 2018. 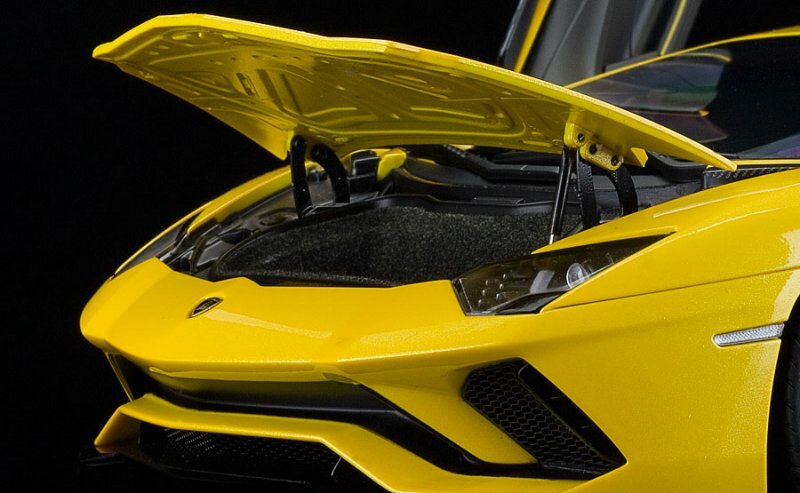 On the side the Aventador S comes with a new side sill and large air intake, also note there is a vent in front of the rear wheels now too, and this model comes with rear wheel steering. The rear wheels actually turn a small degree depending on speed and the position of the front wheels, while a brand new lower rear diffuser is fitted with a stunning looking triangular shaped, central exhaust system. 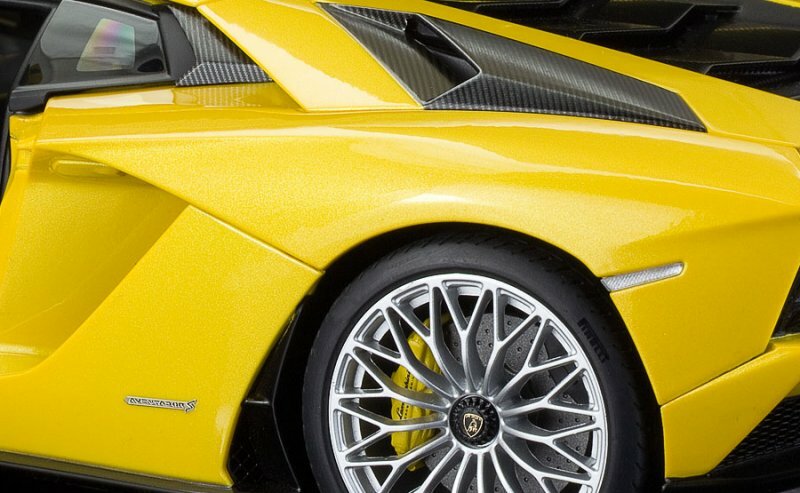 The rear wing is similar to the one used on the original Lamborghini Aventador LP700-4, raising at different degrees depending on speed. 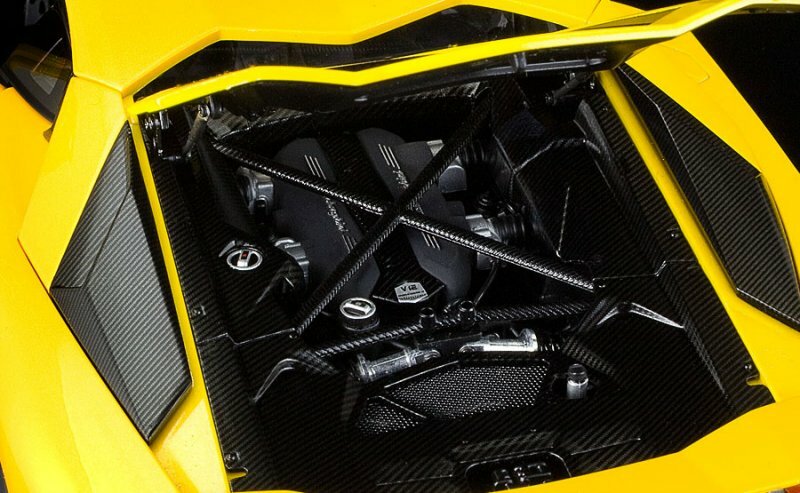 Those impressive looking, adjustable shoulder air intakes from the ‘old’ model didn’t make it onto this new Aventador S, instead, the fixed intakes from the LP750-4 Superveloce model have been fitted. 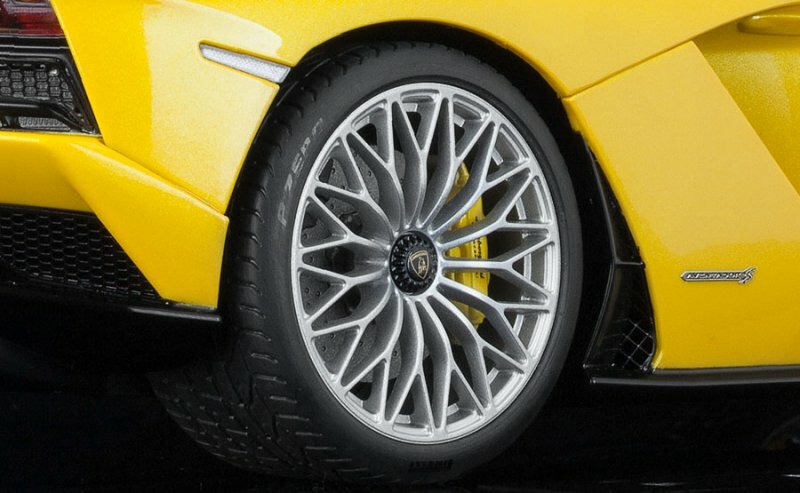 The center lock Dianthus wheels are now also an option for the Aventador S, even finished in silver now. 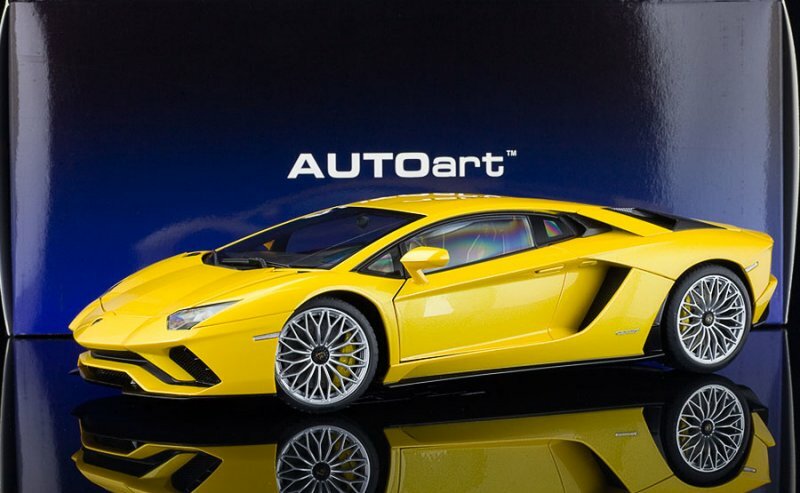 It took AUTOart almost two years to get their 1:18 scale model ready for delivery, in December 2018 this New Giallo Orion finished Aventador S arrived, and the wait was worth it. 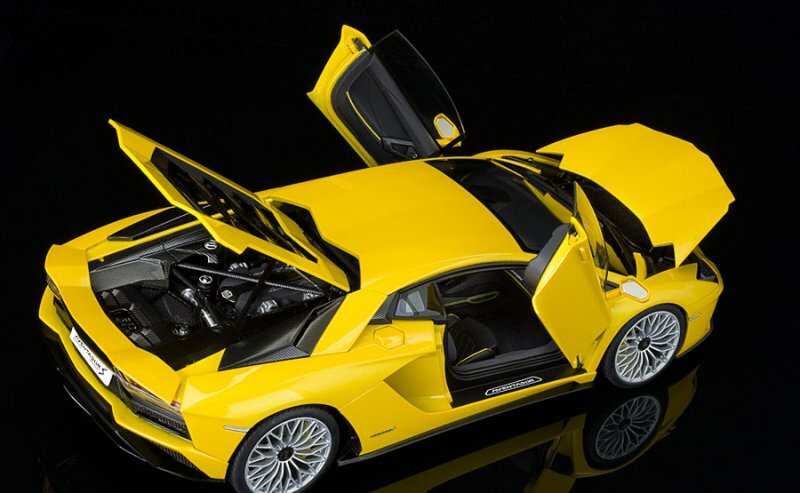 This is an amazing looking model with sharp styling, amazing attention to detail and a near perfect scale replication of the actual press release car from Automobili Lamborghini SpA, and you all know how much I like those. 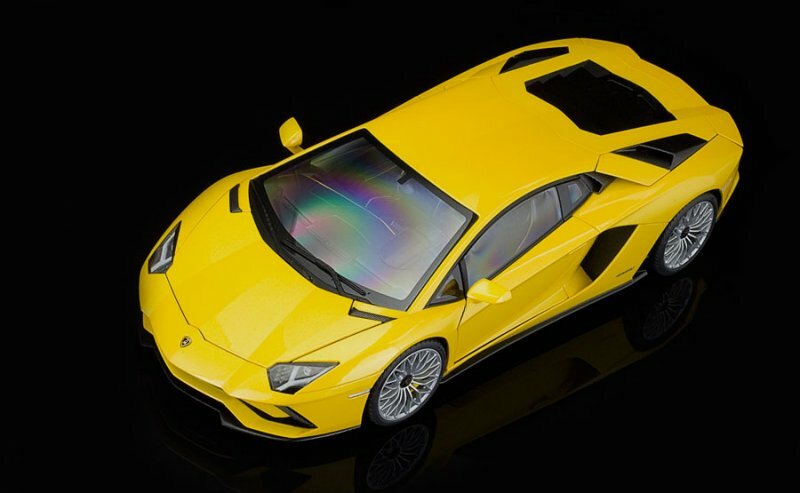 And before anyone starts about the ‘composite’ thing again, yes, this is a composite model, and I know the first Aventador LP700-4 models from AUTOart were ‘real’ diecast models, but that entire discussion is getting old, and you can’t deny the fact this new composite version of the Aventador shows a lot crispier lines compared to the metal diecast version. 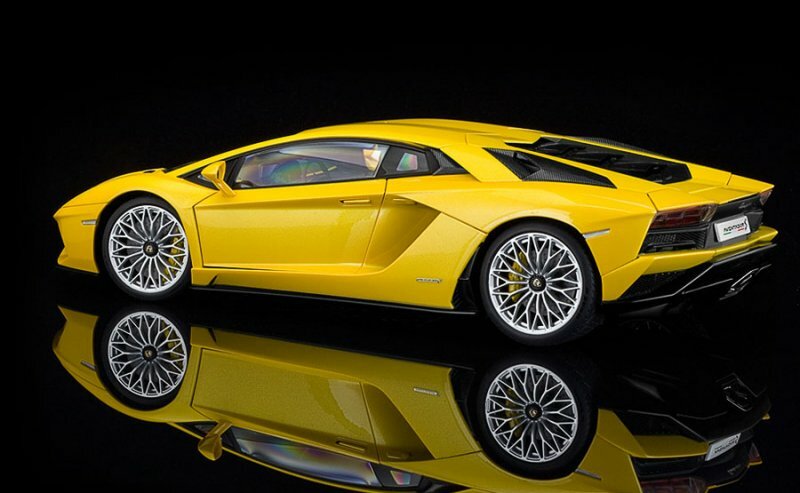 It seems the very sharp body lines on the Aventador can be replicated even better by AUTOart in a composite material, so I like this evolution. Yes, you have to be careful opening the doors, the front hood, and the engine cover but have you seen the hinges on the diecast model they look just as fragile as on these new releases, these aren’t toys, and you are not supposed to be opening and closing this model all the time. These are collector’s items, not playthings … I don’t see people complaining about not being able to open an MR model or one of those stupid expensive D&G models so stop complaining about AUTOart being composite now! They are here and they won’t go away anytime soon… and if AUTOart is able to make their models look even sharper now, I’m all in. 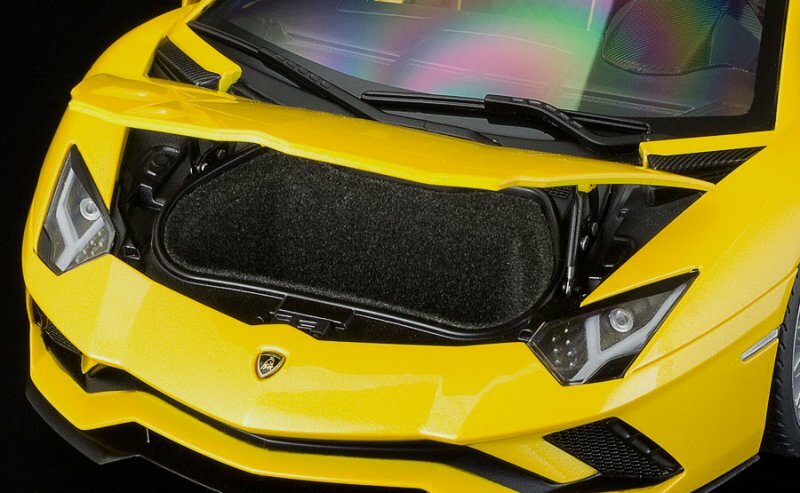 So we can open the front hood to unveil a nicely detailed, upholstered luggage space, there is a strut to keep the hood open and you can clearly distinguish the filler cap hiding in there. 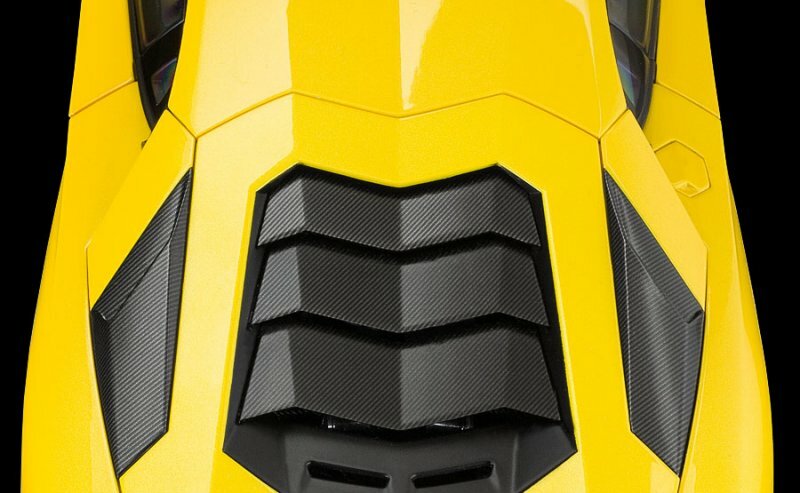 Opening the engine cover, which comes with clear carbon fibre fins on this model, we find a lot of carbon fibre around the nicely detailed V12 powerplant, 740hp in real life, even the X-Cross is finished in carbon fibre. The engine cover is held up with a pair of struts, by the way, I would have loved yellow springs to get some colour in the engine bay, but they are black on the real car too, so this is how they should be on the model too. The fixed air vents behind the engine cover are finished in clear carbon fibre on this AUTOart model, this is, in fact, an option on the real car called ‘Carbon upper art’, together with the smaller vents behind the side windows and the two fins in front of the windshield. 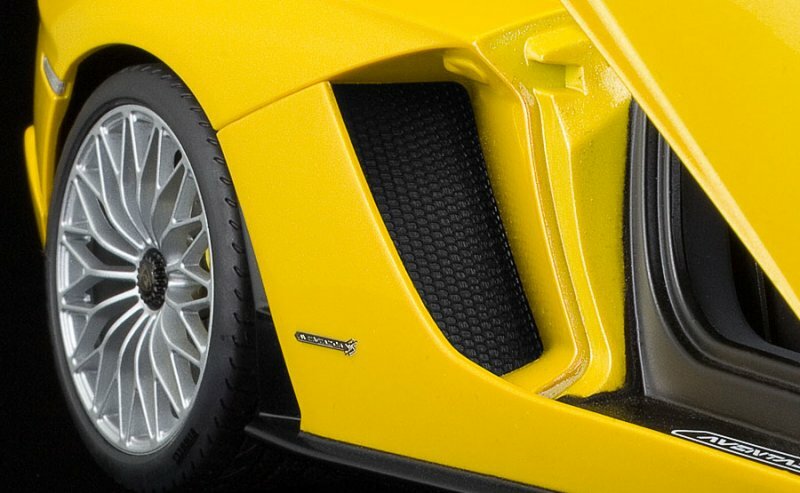 One thing AUTOart missed on their scale model of the Aventador S: the press car had another option ‘Carbon lower part’; clear carbon fibre finish on the lower part of the front bumper, the side sills, and the rear diffuser. AUTOart made these flat black, the standard finish, I for one would have loved to see carbon fibre on those parts too. But other than that detail, this 1:18 scale model from AUTOart is just about perfect, with the new rear fascia, the beautifully replicated headlights and taillights, even the adjustable rear wing is still there, and those silver Dianthus forged wheels demand attention covering the yellow brake calipers complete with Lamborghini Carboceramici script and the carbon ceramic disc brakes, all nicely reproduced. 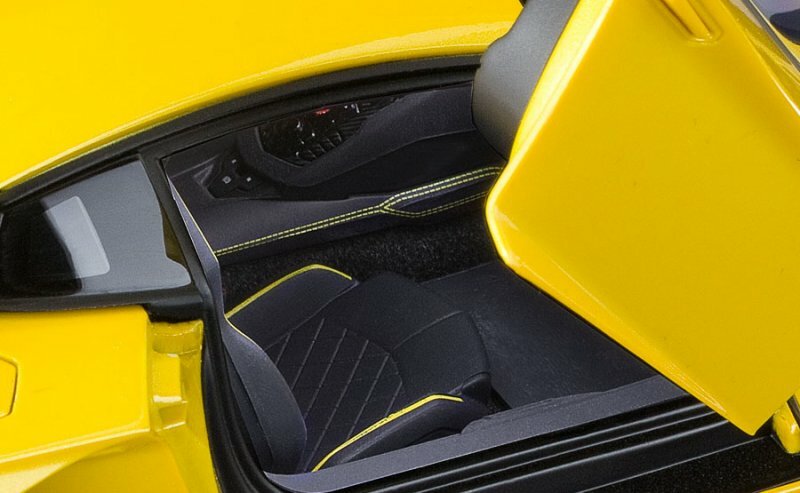 On the inside we find the correctly optioned interior, with seats featuring what looks like the Q-Citura stitching pattern, but this is now called ‘S-Trim’ because the diamond pattern is only there on the inner part of the seats and comes with a larger ‘piping’ in yellow on the seat corners and horizontally on the dashboard, even the small section underneath the headrest comes in yellow in the S-Trim while yellow stitching is visible throughout the interior too. 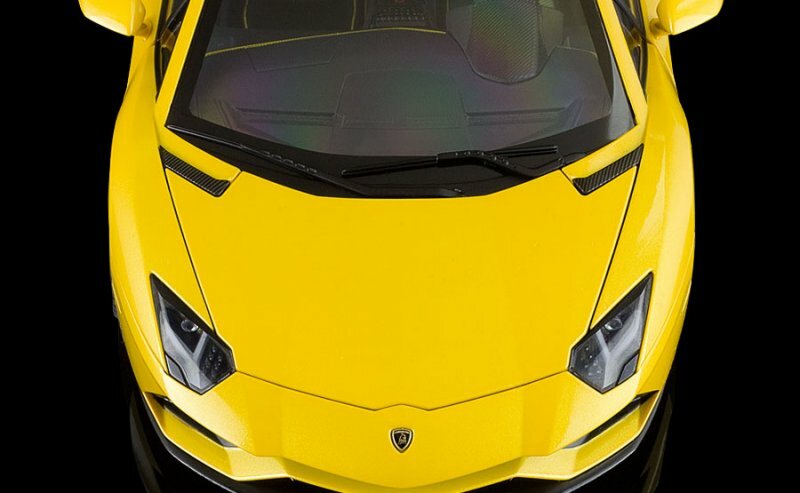 The Raging Bull logo on the headrest completes the yellow S-Trim with the branding option, AUTOart even got the silver Lamborghini script on the dashboard right, remember that was black inside the Superveloce. 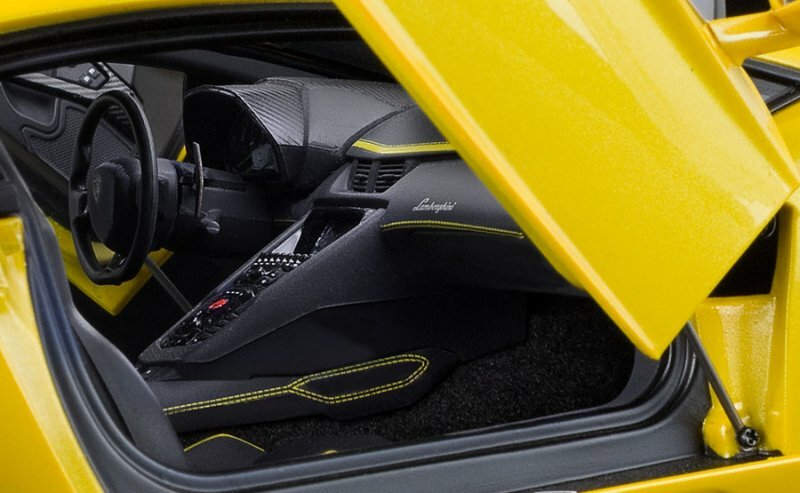 Furthermore, the Aventador S can be fitted with a lot of clear carbon fibre on the interior, more specifically on the door handles, the central console and the LCD surround in front of the driver, note the steering wheel now has glossy black details instead of the silver ones found in the original Aventador LP700-4. All nicely replicated by AUTOart. 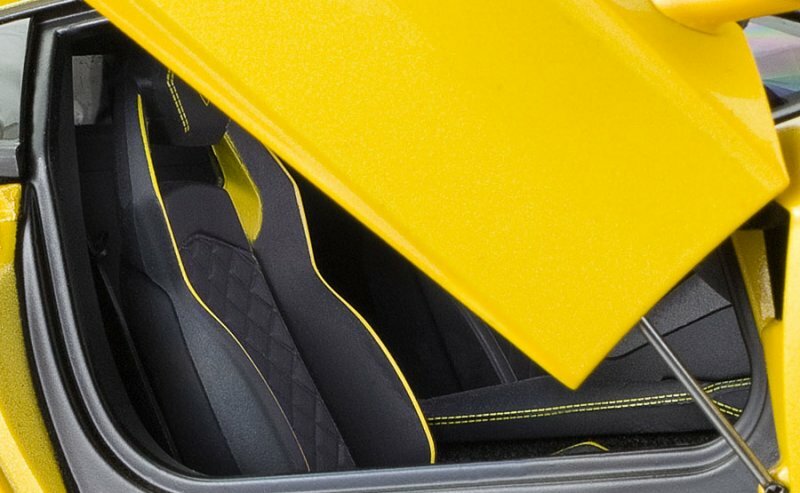 One thing that is still very difficult to replicate on a smaller scale is the Alcantara upholstery this New Giallo Orion finished Lamborghini Aventador S came with a black Alcantara interior, the pearl white metallic one came with a stunning brown leather interior, but it seems Alcantara can’t be made in 1:18 scale so these seats don’t really show that special upholstery, but that’s fine they look amazing nonetheless. 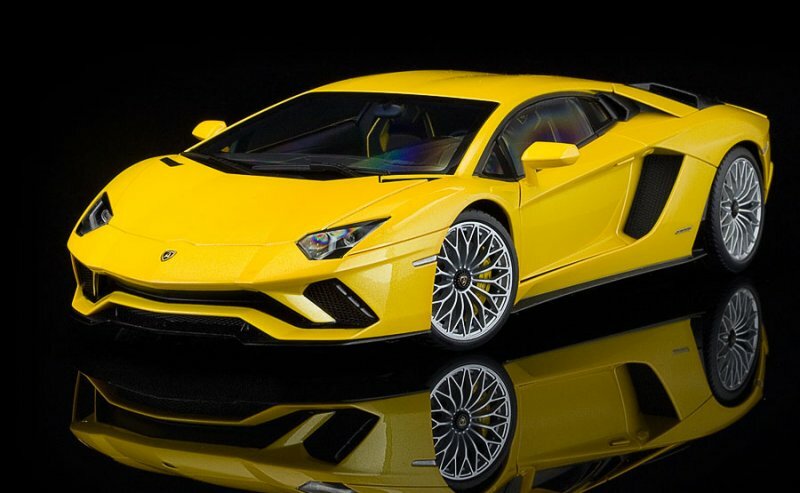 I really love this new evolution of the Lamborghini Aventador made by AUTOart, the detail about the lower carbon fibre parts isn’t a dealbreaker at all, from a distance you can’t even notice 1:18 scale carbon fibre anyway, and while some complain about the wheels on this yellow version, these silver Dianthus are the ones Lamborghini fitted to the press car, so I prefer these. 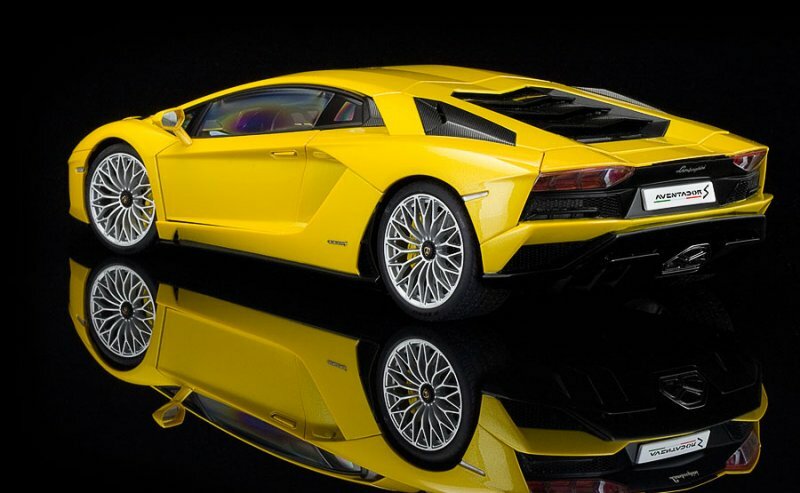 22 Responses to "REVIEW: AUTOart Lamborghini Aventador S"
Did you read the review? Or is your mindset that composite isn’t a viable material? There is way more positive here than negative. Agree. This looks like a far better model than near enough anything I’ve seen from GTS. Interesting to hear a positive review of a ‘composite’ model. It’s theoretically possible to get much sharper body shapes and tighter tolerances with injection moulded plastic than with die cast metal – the only way metal die casts can match it is if you spend a lot of time machining it afterwards, and that would make these models far more expensive. It’s taken AutoArt a little while to get there but it really does seem like they’re improving a little. The materials of a model are very important to me. Having more than my fair share of new AA models i have to say they feel like “garbage”. Accuracy is very important but tactile feel cant be ignored. I tend to play with my models. I have a small collection of 300 plus 1/18 cars so i have a little experience. You like to play with your toys then buy cheap Maisto toys which are actually diecast and have hours of fun kid. Why not BBR metal got a lot of those or even CMC cars got quite a few of those as well. Let’s not forget real cars got a few of those as well ;) i can play with all of these till my heart content. I get you are a look but don’t touch kinda guy hence the sage advice but some of us like to handle the merchandise all the merchandise. AAs shift from diecast is very sad having seven Zonda RS and evos I think it’s time to go back to making great models instead of making plastic crap. Well you are right, the thruth is I barely take my models out of the shelves just to clean them up I don’t really care for the material but you do! And I get it you play with your models so you maybe need heavy and strong ones. Then composite or plastic is not for you, but is it really necessary to call them ‘crap’ I mean I do collect plastic models so that makes me a crap buyer? Then I’m crap that’s what you mean? You can buy whatever you want but keep your negative coments for you, forma respect dude! I understand peoples reaction towards composite models. If you keep your models behind a glass and do not hold them or play with them they may seem fine. Otherwise they really feel toyish. This comes from someone who still buys AA s composite models. I have the baloon white Aventador S. The paint and interior details are fine but fit and finish could have been better i guess. Especially the front hood. Whether it’s diecast or composite doesn’t matter to me as I’m now priced out of being able to afford them. Autoart is the best brand! Nice review! And to be honest, the Composite (plastic) models are getting better and better. Some collectors will not like this, but why should a car that is not made of metal in real, be made in metal as model? People don’t like change, that’s the whole point. The lines on the composite models and panel gaps are now better than any die-cast model can be. I own some composite AA models now, and I like them very much. Very sharp and crisp, with excellent paint. And as a bonus, no change of paint rash. How the plastic will hold after some decades, we don’t know, but no die-cast paint rash. Your two points are indeed the most important IMO. 2) No PAINT RASH !!! I started collecting 1/24th I have prob. 100+ (Franklin Mint and mostly Danbury), some are very rare now but paint rash have reduced some of them to almost valueless collectors junk. 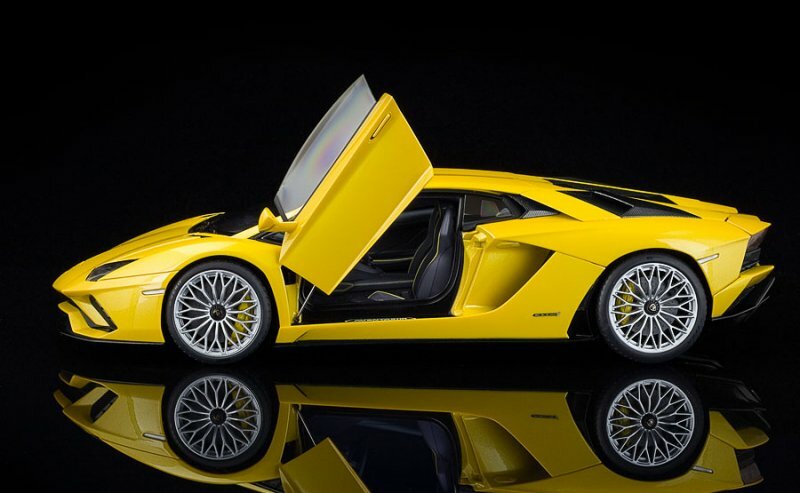 @1) Actually I found nothing wrong about the shutlines of AA´s own Aventador Roadster´s doors. Side by side with the brochure you find them on par with the original. (Follow link in my name to the photos), whereas the photos for this review reveal worse panel gaps, especially because they are uneven in width. First of all, thank you very much indeed for the review. 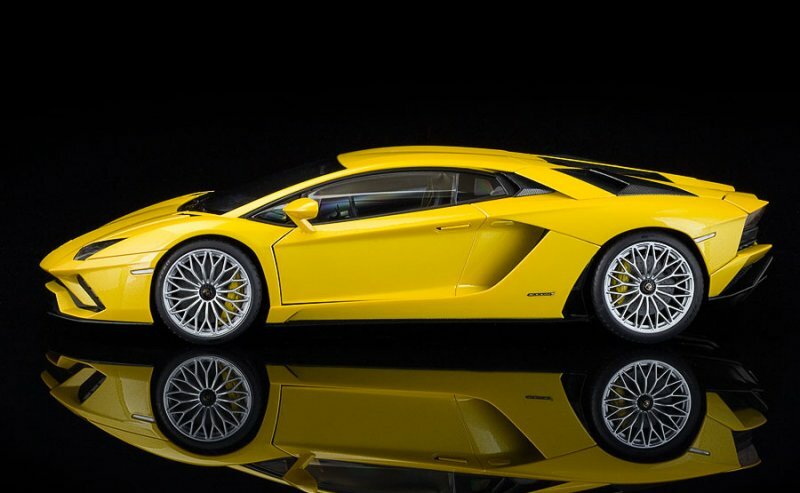 I regard LAMBODIECAST as the supreme judge over anything Lambo as far as truth to the original goes and share the passion for press/auto show presentation versions. I have to admit that sharper line moulding and the exclusion of the dangers of paint rash count as a huge plus in my book. However, plastic injection does not seem to solve all the problems it was allegedly invented for, e.g. panel gaps. Doors and rear (movable) wing show quite some and what´s worse, uneven gaps the likes of which have just evoked quite some criticism for the new (diecast) Almost Real Mulsanne Grand Limousine. Plastic might be able in theory to shut tighter, but being too delicate to “fall into place” with the “clunk” of diecast finally doesn´t. The panel gap whining is exaggerated IMHO anyway: The day of “see-through-the-whole-model-gaps” of a 90s Burago a long gone. Plastic won´t go away (as long as there are buyers) but hopefully neither will diecast. We all profit from Almost Real exploring the limits of diecasting further than AA (as yet at cheaper prices!) and challenging AA by making models of the same cars. 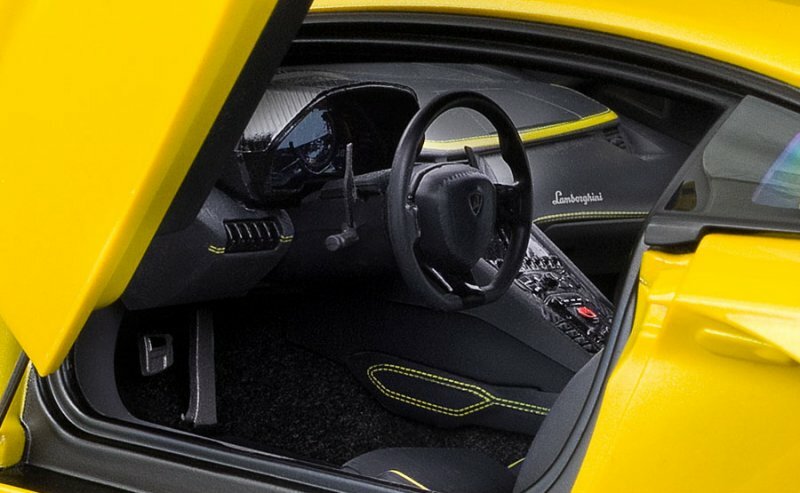 The Lambo´s interior probably would not be as good as it admittedly is if it wasn´t for Almost Real´s excellence; AA had/has become a little lazy there (cf. S-Classes). AA still has the upper hand on lights. AR again seems a little better replicating carbon. AA´s Centenario clear carbon will be cards-on-the-table in this respect and I am looking forward to LAMBODIECAST´s review of it. In the absence of Lambo-competition from AR, the real battlefield for excellence will be the Huayra Roadster blue carbon, though. Very well said. We like to add, AUTOart for the most part are good. But it seems the inconsistency of the little details are not what they once were. Their interiors and motors on older models were definitely better defined. How one uses rubber for seat-belts is still beyond us. As eluded too, hopefully with Almost Real and others just surfacing it will make them re-evaluate the overall execution just a little bit more. Well, AA’s composites have gotten better in response to consumer criticism and probably waning sales, but it all still pales in comparison to what they once were in overall detail. Like many collectors, I prefer the tactile feeling and heft of diecast over plastic, but I’d be willing to “try” composite again if they could at least get the interior/engine details back on par to what they once were. The new composites, while better, still pale in comparison to once they once were. As long as this is the case a lot of diecast collectors wont touch AA with a ten foot pole and they will continue to bleed. Great review. I am not a fan of AUTOart’s current approach and material choice but your reviews are slowly but surely enlightening me. I just wished they would be doing some vintage or modern classics too instead of too many supercars/hypercars. Autoart will never be as good as they once were. Higher prices and ever decreasing quality. Not a fan, brands like AlmostReal giving Autoart a run for their money. Thanks for adding another aspect to what I meant with uneven panel gaps and doors that won´t “fall” into place, but need to be coerced into alignment. Haven´t thought about this causing cracksin the paint when the plastic flexes under pressure. Whether the plastic itself may become brittle and crumble/break over the years remains to be seen. That would be at least as bad paint rash.